Home Study course for professionals to obtain Advanced Qualification as a Cancer Exercise Specialist™. 4 Modules & Testing Included. 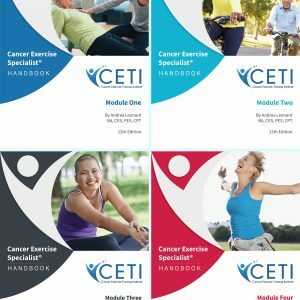 Plus private Facebook group access, training & qualification testing, Webinar Q&A, 1 Year MedFit Network membership and 2 year CETI CES listing included. Hard copy handbooks available upon request, pay only printing cost + shipping fees.